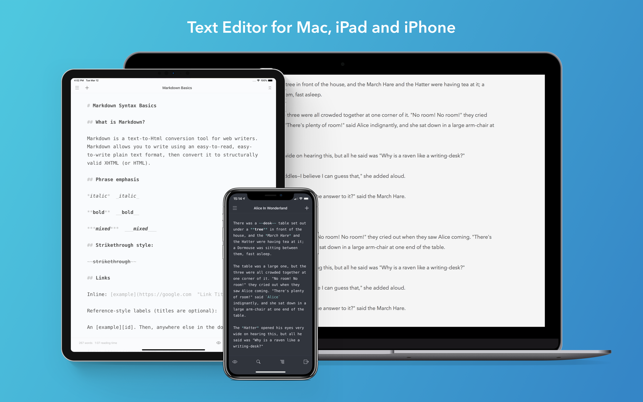 iWriter Pro is simple and elegant text editor with built-in Markdown support. - Sync across all your Mac, iPad and iPhone devices. - Text editing with live syntax highlighting. 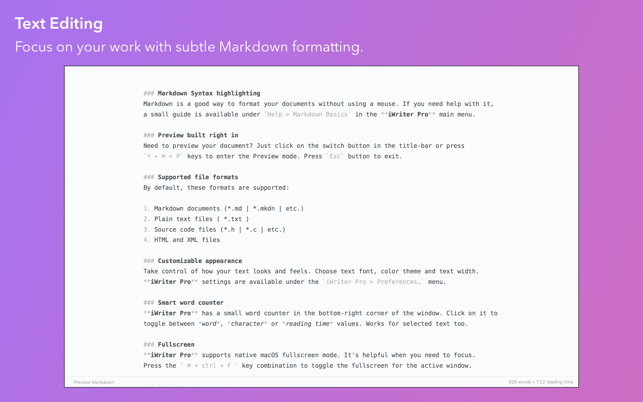 - Preview for Markdown and MultiMarkdown documents. - Fast and responsive editing even for large files. - Reading time, word and character counters with live update. - QuickLook plugin for Markdown documents. 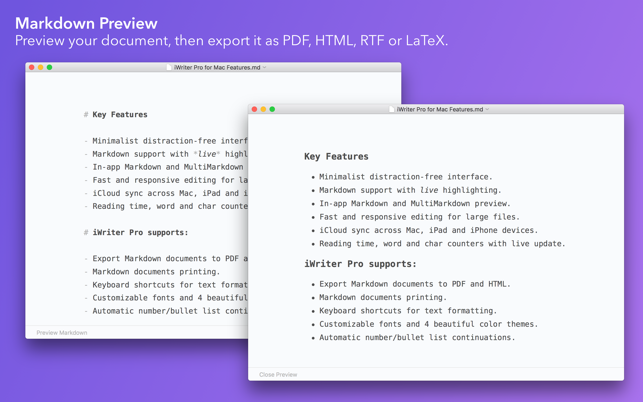 - Export Markdown documents to HTML, PDF, RTF and LaTeX. - Keyboard shortcuts for formatting and navigating within text. 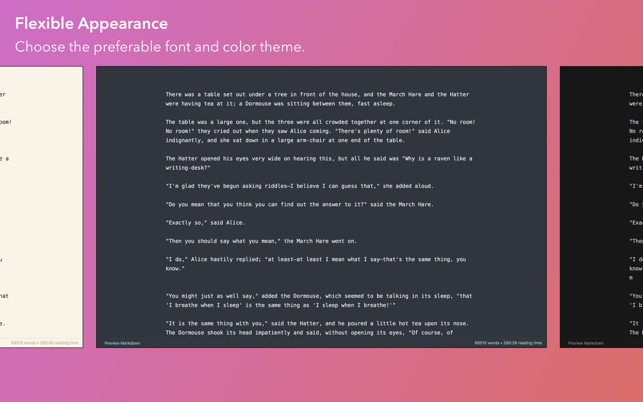 - Customizable fonts and 4 beautiful color themes. - Automatic number/bullet list continuations. Please note: iWriter Pro is designed to be as easy as possible so it works with plain text files only (like ‘.txt’ and ‘.md’). Multi-line lists and blockquotes will use indentation. Export to HTML was fixed. Export to LaTeX was improved. Other minor bug fixes for text editing. So far I like this writing program. I use it mainly to draft projects out. I used use Ulysses for this, but when it went to subscription-based, they lost me. 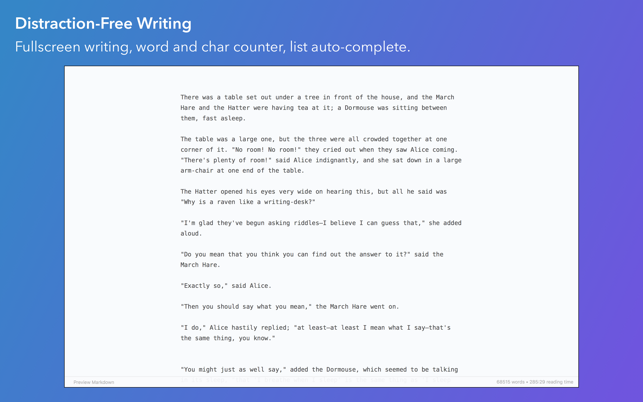 I was looking for another program to replace this program I like a text editor to work out ideas and first drafts and iwriterPro does this well enough. It is easy to organize and syncs across all devices — a huge help to me since I am rarely at home to work on the desktop and generally use an ipad pro. It has a file system that works somewhat like Apple Notes and is a huge help for me. I also like how it has different colors for page color and you can also adjust the text size as well as the font. All-in-all, this is a great basic writing program that works for what I need it for. I’m glad I found it.